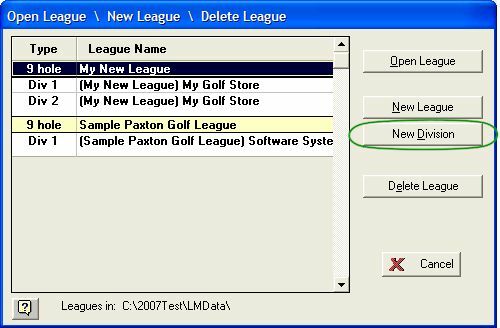 To create a new league, select “Create New League” on the League menu. To open another league\division, select “Open Existing League\Division” on the League menu. To create a new League click the New League button. The “Parameters for League” form will appear. Enter the appropriate information. See Starting Up a League on page 2 for detailed information on creating a new league. Select the league to add a division to and click the New Division button. Note: A division acts just like a separate league, except that substitutes are shared between divisions. Select the league\division to load and double click or click the Open League button. 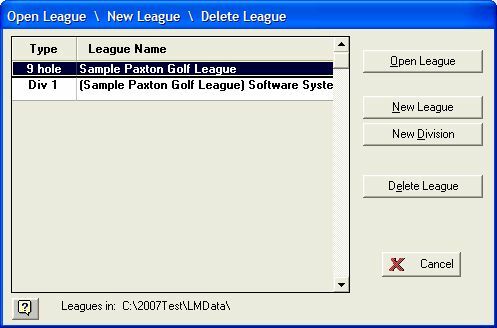 Lets you delete an entire league\division from your computer. Be careful with this option! For safety, the League currently opened cannot be deleted. Select the league\division to delete, and click the Delete League or Delete Division button. Type “YES” to verify deletion.